AWS Key Management Service (AWS KMS) now supports Amazon Virtual Private Cloud (Amazon VPC) endpoints powered by AWS PrivateLink. This means you now can connect directly to AWS KMS through a private endpoint in your VPC, keeping all traffic within your VPC and the AWS network. Previously, applications running inside a VPC required internet access to connect to AWS KMS. This meant managing internet connectivity through internet gateways, Network Address Translation (NAT) devices, or firewall proxies. With support for Amazon VPC endpoints, you can now keep all traffic between your VPC and AWS KMS within the AWS network and avoid management of internet connectivity. In this blog post, I show you how to create and use an Amazon VPC endpoint for AWS KMS, audit the use of AWS KMS keys through the Amazon VPC endpoint, and build stricter access controls using key policies. To get started, I will show you how to use the Amazon VPC console to create an endpoint in the US East (N. Virginia) Region, also known as us-east-1. 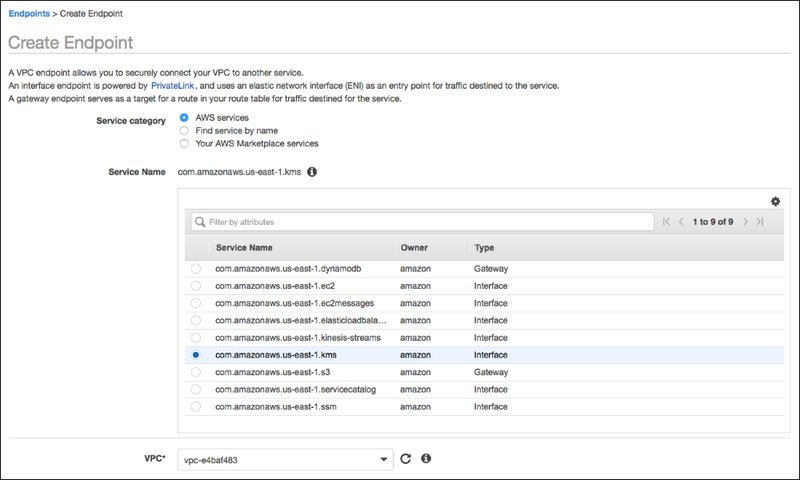 Navigate to the Amazon VPC console. In the navigation pane, choose Endpoints, and then choose Create Endpoint. Choose AWS services for Service category. Choose the AWS KMS endpoint service, com.amazonaws.us-east-1.kms, from the Service Name list, as shown in the following screenshot. Your VPC endpoint can span multiple Availability Zones, providing isolation and fault tolerance. Choose a subnet from each Availability Zone from which you want to connect. An elastic network interface for the VPC endpoint is created in each subnet that you choose, each with its own DNS hostname and private IP address. If your VPC has DNS hostnames and DNS support enabled, choose Enable for this endpoint under Enable Private DNS Name to have applications use the VPC endpoint by default. You use security groups to control access to your endpoint. Choose a security group from the list, or create a new one. To finish creating the endpoint, choose Create endpoint. The console returns a VPC Endpoint ID. In our example, the VPC Endpoint ID is vpce-0c0052e3fbffdb450. To connect to this endpoint, you need a DNS hostname that is generated for this endpoint. You can view these DNS hostnames by choosing the VPC Endpoint ID and then choosing the Details tab of the endpoint in the Amazon VPC console. One of the DNS hostnames for the endpoint that I created in the previous step is vpce-0c0052e3fbffdb450-afmosqu8.kms.us-east-1.vpce.amazonaws.com. You can connect to AWS KMS through the VPC endpoint by using the AWS CLI or an AWS SDK. In this example, I use the following AWS CLI command to list all AWS KMS keys in the account in us-east-1. 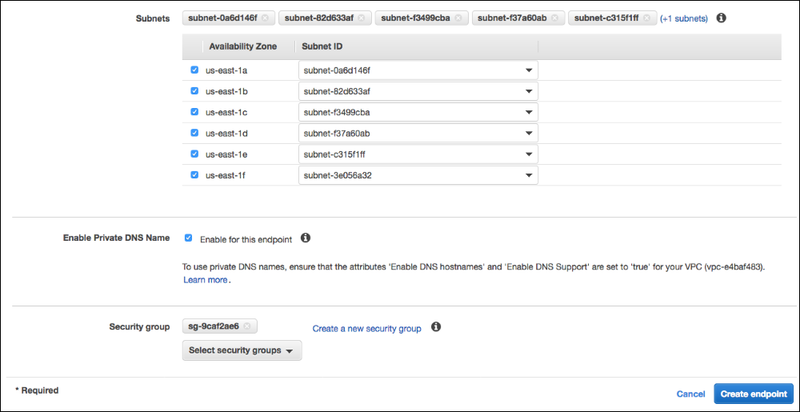 If your VPC has DNS hostnames and DNS support enabled and you enabled private DNS names in the preceding steps, you can connect to your VPC endpoint by using the standard AWS KMS DNS hostname (https://kms.<region>.amazonaws.com), instead of manually configuring the endpoints in the AWS CLI or AWS SDKs. The AWS CLI and SDKs use this hostname by default to connect to KMS, so there’s nothing to change in your application to begin using the VPC endpoint. 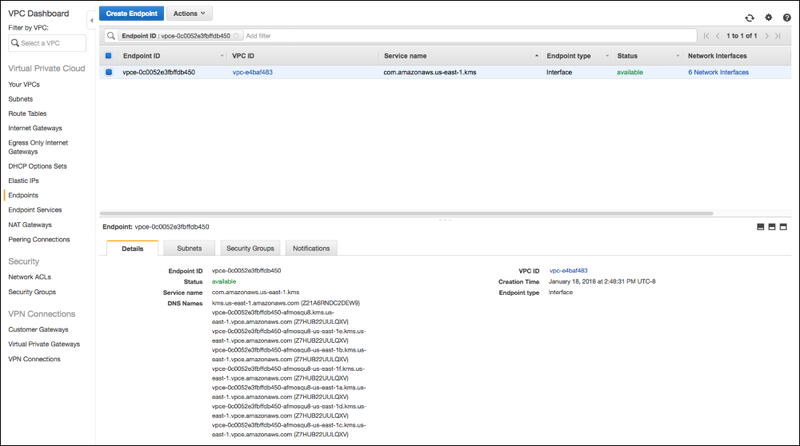 You can monitor and audit AWS KMS usage through your VPC endpoint. Every request made to AWS KMS is logged by AWS CloudTrail. Now, when you use a VPC endpoint to make requests to AWS KMS, the endpoint ID appears in the CloudTrail log entries. A good security practice to follow is least privilege: granting the fewest permissions required to complete a task. You can control access to your AWS KMS keys from a specific VPC endpoint by using AWS KMS key policies and AWS Identity and Access Management (IAM) policies. The aws:sourceVpce condition key lets you grant or restrict access to AWS KMS keys based on the VPC endpoint used. For example, the following example key policy allows a user to perform encryption operations with a key only when the request comes through the specified VPC endpoint (replace the placeholder AWS account ID with your own account ID, and the placeholder VPC endpoint ID with your own endpoint ID). This policy works by including a Deny statement with a StringNotEquals condition. When a user makes a request to AWS KMS through a VPC endpoint, the endpoint’s ID is compared to the aws:sourceVpce value specified in the policy. If the two values are not the same, the request is denied. You can modify AWS KMS key policies in the AWS KMS console. For more information, see Modifying a Key Policy. You also can control access to your AWS KMS keys from any endpoint running in one or more VPCs by using the aws:sourceVpc policy condition key. Suppose you have an application that is running in one VPC, but uses a second VPC for resource management functions. In the following example policy, AWS KMS key administrative actions can only be made from VPC vpc-12345678, and the key can only be used for cryptographic operations from VPC vpc-2b2b2b2b. The previous examples show how you can limit access to AWS KMS API actions that are attached to a key policy. If you want to limit access to AWS KMS API actions that are not attached to a specific key, you have to use these VPC-related conditions in an IAM policy that refers to the desired AWS KMS API actions. In this post, I have demonstrated how to create and use a VPC endpoint for AWS KMS, and how to use the aws:sourceVpc and aws:sourceVpce policy conditions to scope permissions to call various AWS KMS APIs. AWS KMS VPC endpoints provide you with more control over how your applications connect to AWS KMS and can save you from managing internet connectivity from your VPC. To learn more about connecting to AWS KMS through a VPC endpoint, see the AWS KMS Developer Guide. For helpful guidance about your overall VPC network structure, see Practical VPC Design. If you have questions about this feature or anything else related to AWS KMS, start a new thread in the AWS KMS forum.